Closed System Catheters from UTI Medical of OhioUTI Medical, Inc. The closed system catheter is ideal for away-from-home cathing and cathing at a time or place where access to suitable facilities is not possible. 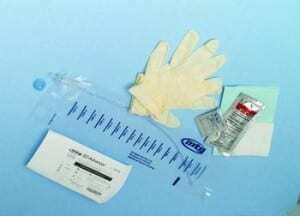 The catheter kits contain all of the supplies needed to perform proper sterile cathing. Additionally, the urine goes into a plastic bag which can be secured and disposed of at a later time. This type of catheter can be used by both men and women. They range in sizes from an 8 Fr to 18 Fr. Unlike straight or coude-type intermittent catheters that are pulled out of sterile packaging for use, an intermittent closed system catheter stays inside the package and is fed into the body without coming into contact with the hands. The catheter is introduced to the body through the use of an introducer tip and a bag is then attached in order to collect the patient’s urine. Closed system catheters prevent any external contamination of the catheter during preparation and the protective sleeve helps dramatically reduce the potential of urinary tract infections by reducing bacteria entering the bladder. Catheters are not one size fits all. We will work to fit each patient with a catheter system best suited for your individual needs. We carry all the top brands. And we will provide you with products that are critical in eliminating the opportunity for infection. Learn more about the personal, professional services we provide to ensure your satisfaction. Contact UTI Medical today for a personal consultation and to purchase closed system catheters.